A recent study shows 6 out of 10 Filipinos now prefer credit cards over cash because of the safety and convenience they offer. You can get these credit cards from virtually any bank in the Philippines. But if you want to ensure your account is in good hands, nothing beats the stability offered by established banks like BDO. EasyPay program which enables you to buy expensive items from over 11,000 partner stores on an installment basis with 0% interest. A free virtual card you can use for online shopping. This card is different from your regular credit card to protect you from online fraud. Exclusive freebies, discounts, and privileges when you use the BDO credit card at partner stores. Hassle-free bills payment either through Charge-On-Demand or Auto Charge scheme. 24-hour customer service you can reach at 631-8000 or 1-800-10-6318000 (Domestic Toll-Free). A convenient way of paying credit card bills through various payment channels: over-the-counter, Internet, phone, or SM Bills payment counters. Ability to do cashless transactions almost anywhere in the world through BDO Mastercard credit card which is accepted in over 20 million locations across 275 countries and territories. Applying for a BDO credit card, however, is a completely different story. Whether you’re a first-time applicant or someone who already have an existing credit card, rejection is always a possibility. In this guide, we’ll not only help you find the best BDO credit card that fits your needs and lifestyle. Through easy-to-follow steps, we’ll also take you through the exact process to apply for a BDO credit card and actually get approved. 1. Build a good credit history. Build and maintain a good credit profile. Open and maintain a big savings account. 2. Choose the right BDO credit card for you. Regular or Basic Credit Card. c. Dining and Entertainment Rewards. 3. Know the basic qualifications for BDO credit card application. 4. Complete the BDO credit card requirements. For Applicants with Existing Credit Card/s. For Applicants without Existing Credit Cards. 5. File your BDO credit card application. 6. Wait for the approval of your BDO credit card application. 7. Activate your BDO credit card. 1. 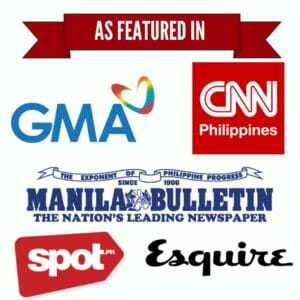 Can I apply for a BDO credit card if I’m an OFW? 2. Can I pay my utility bills using BDO credit card? 3. What is a credit card limit? 4. I’m a student/first-timer/freelancer/stay-at-home mom with no proof of income. How can I get a BDO credit card? No bank will ever issue you a credit card or even a small loan if your poor financial decisions in the past suggest you’re a liability. So how do banks assess an individual’s credit profile? a. Get a copy of the applicant’s credit report from the Credit Information Corporation (CIC) or from any of its accredited Special Accessing Entities (SAEs). A credit report contains basic information like your name, government ID numbers (e.g., TIN, SSS, etc. ), employer or business, and a copy of your contracts with banks and lending institutions. Under Republic Act 9510, the CIC is authorized to collect your credit report, whether it’s negative or positive, and then issue it upon request either to you or the bank/lending institution you’re transacting with. b. Have an underwriter review your credit card application. This applies if you already have an account with the bank where you’re applying for a credit card. Since they already have access to your data, the bank doesn’t need to request a copy from the credit bureau. If you struggle to pay your loans, why would BDO trust you with their credit cards? Put your best foot forward by keeping your credit profile squeaky clean. Close down all credit cards that left you a bad record. Pay off your debts or keep them at a minimum. In other words, do everything to prove to BDO that you’re capable of paying credit card bills. A zero credit history can likewise hurt your chances of getting approved. For one, having a blank slate provides BDO with absolutely no way to gauge your ability to maintain a credit line. Hence, it’s important to build a credit profile no matter how small as early as you can. Start by availing quick-access personal loans that don’t require existing credit history. Companies like Loan Ranger offer this type of loans to allow first-timers to build their record. Loan Ranger is also connected with the credit bureau so keeping a good record with them will benefit you in the long run. Alternatively, you can get any of the secured credit cards that don’t need the same strict requirements as regular credit cards. Make sure to pay off your debts on time to prevent creating a bad record. If you’re fortunate enough to be issued a credit card with a low credit limit, be patient and use this opportunity to establish a good credit history. Once you’ve proven your ability to maintain a good credit line by regularly paying your bills in full and on time, the bank will be more than glad to offer you another card with a higher credit limit. This trick guarantees that your credit card application will get approved even if you have no existing credit card. Keep piling up money in your account and maintain rapport with the BDO branch. If you do it this way, you don’t have to come to them for your credit card application. Instead, BDO will be the one to offer you their financial products–credit cards included–based solely on the number of your assets with them. BDO and any bank for that matter can smell desperation even from a distance. By repeatedly doing follow-ups on your application, you’re suggesting that you’re desperate to have a credit card and that it’s more than likely that you were rejected several times before. Banks follow a specific procedure to verify and assess each credit card application. Unless it’s outside the waiting period (more on this later) given by BDO, don’t bother calling them or you might sound the alarm. With over 20 BDO credit cards from 6 different brands (Visa, Mastercard, American Express, JCB, UnionPay, and Diners Club), it’s easy to end up with the wrong card that doesn’t fulfill your needs. Therefore, it’s important to know yourself–your needs, lifestyle, and spending patterns–before heading to the bank for credit card application. In general, there are three types of credit cards, each one suitable for a specific need or lifestyle. Spend time reviewing the fine print of each credit card and make a decision based on factors that matter the most to you. For example, a credit card that earns air miles is great for frequent travelers but not the right fit for people who regularly spend on groceries every month. To help you choose the best BDO credit card, let’s go over each credit card type in detail and explore the different options available for you. Basic BDO credit cards are perfect for those who care more about convenience than rewards. These cards require a lower minimum gross annual income of Php 180,000 and also the lowest annual membership fees which are charged from cardholders on a monthly basis at Php 125 to Php 200. The downside of owning a basic BDO credit card is the higher interest rate of 3.50% and less exclusive perks available for the cardholders. Since they have relatively higher interest rates, regular or basic BDO credit cards are only used occasionally or in case of emergencies, making them the perfect companion for first-time cardholders who are still building up their credit history. The American Express Gold Credit Card. The Cathay Pacific American Express Credit Card. The American Express Cashback Credit Card. While BDO rewards credit cards have higher annual fees (Php 1,800 – Php 3,000) than basic cards, the cost is offset by the exclusive perks and reward points you’ll get for every purchase. Depending on your lifestyle, you can choose from different cards that offer a wide range of rewards–rebates on air miles, cash back, travel privileges, or rebates from gas and auto companies. If you’re a frequent shopper, for example, it’s wiser to use a rewards card than paying with cash or a debit card. Whereas the latter earns you zero rewards, a BDO credit card allows earning cash back for every item you buy. A cash back is a type of perk which enables you to earn back a percentage of the money you spend on your credit card. Do you use your car every day? BDO offers a rewards credit card that gives you points for fuel or gas purchases. Hit by a travel bug? Choose from the various BDO cards that reward you with air miles or travel points on every peso you spend. Whatever reward you’re looking for, make sure you choose the card that offers the highest rewards for the categories you spend most on. Also, consider the minimum amount to qualify for rewards as well as the expiration of such rewards. The less you spend to qualify for the bonuses and the longer the validity period of the rewards, the better. The American Express Platinum Credit Card. The Cathay Pacific American Express Elite Credit Card. Premium BDO credit cards are reserved for high-earning individuals with affinity to upscale purchases. These cards have a higher credit limit, annual fees, and interest rates but also offer some of the best exclusive perks like travel insurance, front row seats to concerts, product warranty, and emergency services, to name a few. BDO only offers these cards to affluent consumers who can afford to pay their credit card bills in full every month. This explains why their minimum gross fixed annual income requirement (from Php 1,000,000 to Php 1,800,000) is significantly higher than the other credit card categories. a. Age: 21 – 70 years old for principal cardholders and at least 13 years old for supplementary cardholders. b. Filipino citizen OR a foreigner who has been a permanent resident of the Philippines for the last two years. Php 180,000 (Bench/Forever 21/ShopMore and Standard Mastercard, Visa Classic, JCB Lucky Cat Credit Card). Php 420,000 (Gold Credit card, Diners Club International and American Express Cashback Credit Card). Php 480,000 (American Express Credit Card). Php 1,000,000 (Titanium Mastercard and Diners Club Premiere Credit Card). Php 1,200,000 (Platinum Mastercard, Visa Platinum, JCB Platinum, Diamond UnionPay, and Cathay Pacific American Express Elite Credit Card). Php 1,800,000 (American Express Platinum Credit Card). d. Regular employee OR self-employed (with business operating for at least 2 years). e. With at least 1 landline phone or a postpaid mobile phone. f. With residence/office address within any area with a BDO branch. After confirming your eligibility to apply for a BDO credit card, complete all the documentary requirements that will prove your identity and income to the bank. a. Photocopy of the front section of the other credit card/s. b. Original copy of the existing credit card’s statement of account (SOA) for the last two months that is at least 1 year on books. Professional Regulations Commission (PRC) ID. National Bureau of Investigation (NBI) Clearance. Government Service Insurance System (GSIS) E-Card. Social Security System (SSS) Card. Alien Certification of Registration or Immigrant Certificate of Registration. Government Office (e.g. Armed Forces of the Philippines (AFP), Home Development Mutual Fund (HDMF)) IDs and other valid IDs issued by the Government and its instrumentalities. d. For employed: Photocopy of the latest BIR Form 2316 signed by the employer’s authorized representative. e. For self-employed: Photocopy of the latest ITR and W4 with BIR stamp. a. Duly accomplished BDO credit card application form. b. Proof of identification (for both primary and supplementary applicants). Company ID, if your company is registered with or supervised by SEC, IC, or BSP. Government-issued ID such as passport, SSS ID, etc. (see the previous section for a complete list of valid IDs). School ID, if you’re still a student and applying for supplementary credit card. Copy of employment contract or Certificate of Employment. Letter from Embassy (if Embassy official). ANY of the following valid documents: Valid VISA and work permit; Alien Certificate of Registration (ACR) or Immigrant Certificate of Registration (ICR) or ACR-I; valid passport with Special Investors Resident VISA, Special Non-Immigrant VISA for PEZA investors and employees, or VISA with EO226. Photocopy of the latest Income Tax Return (ITR) with BIR stamp or BIR Form 2316 signed by the employer’s authorized representative. ANY of the following: Latest payslip (full month); Original Certificate of Employment indicating status, compensation package, and service tenure. Photocopy of the latest Income Tax Return (ITR) with BIR stamp. Photocopy of Audited Financial Statements for at least two years. Photocopy of business name registration (DTI Registration for Single Proprietorship or SEC Registration for Partnership/Corporation). Copy of bank statements for the last three months (optional). Submit the above requirements to the BDO branch where you’ll apply for the credit card. BDO won’t process your application if you come to the bank with incomplete documentary requirements. Go to the BDO branch of your choice and personally submit the duly accomplished application form along with the other requirements. Note that the documents you’ll submit to BDO will not be returned to you. You may also apply online or through text message but all applicants, regardless of the mode of application, will eventually be required to visit BDO to submit the required documents. To apply via SMS, type BDOCC<space>APPLY<space>LAST NAME/FIRST NAME/MIDDLE INITIAL then send to 2256 (Php 2.50 charge for Globe & Smart, Php 2.00 charge for Sun subscribers). BDO meticulously review each credit card application so it normally takes up to several weeks before you receive a call from the bank. If you want to check the status of your application, you can do so by calling the BDO branch where you filed the application or making an online inquiry. To check your application status online, visit BDO website and go to Credit Cards>Services>Card Application Status. Enter your SSS number or TIN (tax identification number) to pull up your account. In case your application gets rejected, inquire about the reason/s why so you won’t commit the same mistake the next time you apply again. Incorrect or insufficient information provided on the application form. Job hopping or unstable job history. After rejection, financial experts recommend working on the reason/s why you didn’t get approved and wait for 3 to 6 months before reapplying. Otherwise, BDO will see red flags on your credit history and consider you too desperate to have a credit card. For those whose applications got approved, you can now activate your new credit card to start using it. 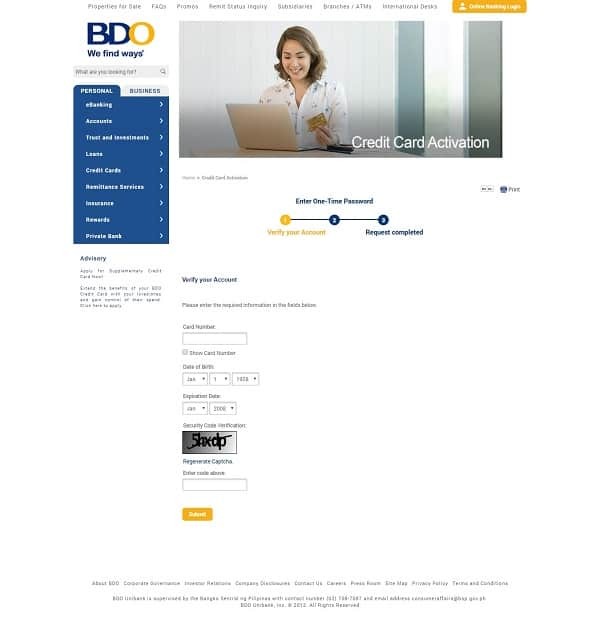 To activate your BDO credit card, visit BDO website and go to Credit Cards>Services>Card Activation. To verify your account, enter your credit card number, date of birth, expiration date of the card, and the security/captcha code provided. 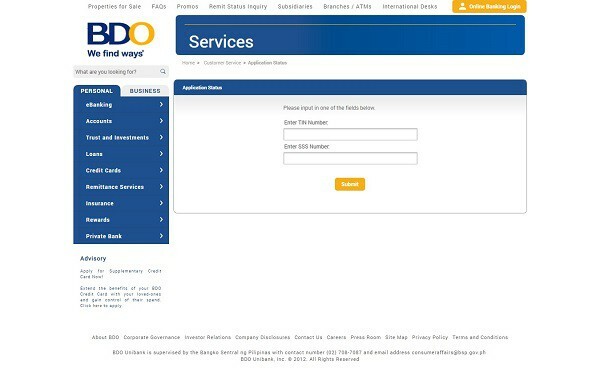 Click Submit and wait for BDO to process your request. Remember that credit cards are a tool that YOU control, not the other way around. It’s very easy to overspend when you forget that you’re still obliged to pay every peso you spend through your card. To avoid “bill shock,” use apps like Toshl Finance to track every item you buy with your BDO credit card. When choosing a BDO credit card, use BDO’s very own online comparison tool to further refine your search and zero in on the best credit card that suits your needs and lifestyle. 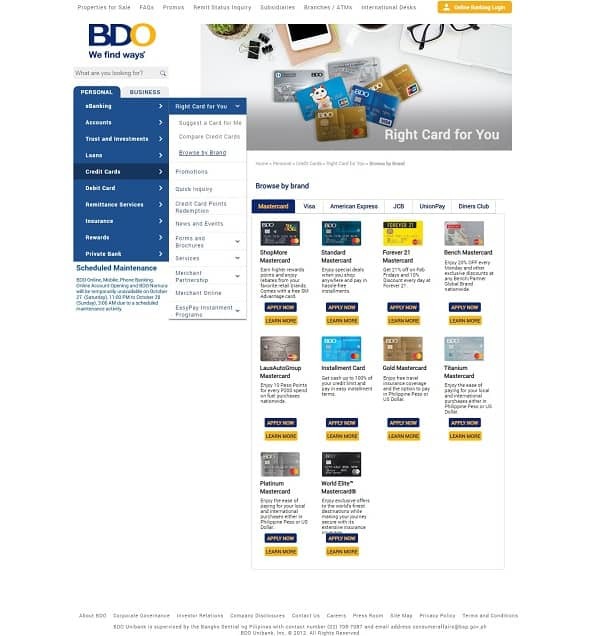 To access this tool, visit BDO website and go to Credit Cards>Right Card for You>Compare Credit Cards. You can compare up to three BDO credit cards at the same time. Upon receiving your new credit card, immediately write your signature at the box provided at the back to make it secure. Pay your balance in full on or before the due date to avoid incurring interest. Always check your statement of account. In case you spot errors, call BDO’s customer care hotline indicated at the back of your credit card. The price of items sold in different establishments should be the same regardless if you’re paying with cash or credit card. If you encounter stores that charge higher prices for payments via credit cards, call DTI Direct at 751-3330. The password you use for online banking should be different from the passwords for your social media accounts. To avoid being a victim of online scams, change your online banking password regularly and make it stronger by using a combination of alphanumeric and special characters (e.g., *, #, @, $, etc. ).